Schooner Fare is a true Maine treasure. On this CD, you'll hear more than three fine musicians, you'll hear the essence of Maine and what makes it such a special place. It's all here--the lighthouses and rocky coast, the stark beauty of "The County," the sailors, fishermen, and factory workers who give our state so much color and character. Some of these songs will make you laugh. They will have you tapping your feet and singing along. Others will send shivers down your spine and bring water to your eyes. All of them will make you proud to live in a state as beautiful and bountiful as Maine. And if you're a visitor who hasn't yet experienced all we have to offer, Steve, Chuck, and Tom will take you there--without even getting your feet wet. So cast off. Set sail. Listen to the sounds of the sea, the gulls flapping overhead, the buoys ringing in the harbor. 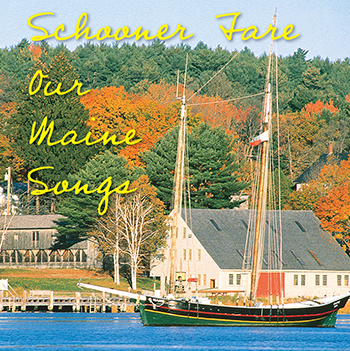 And let the songs of Schooner Fare be your soundtrack. You'll have a wonderful voyage. at number one on the Irish charts. Tom wrote this song one evening with his old friend David Crossman. gone on to become one of the group's favorite sing-a-longs. own ground; Kings can do no more." exchange the news of the day. description of the great whale. before his passing in 1987. Steve wrote "Day of the Clipper" in the early years of Schooner Fare. their tatters and the masts will rise again." And you know the clipper's day has come again. ÔTil every mother's son begins to pray. ÔTil every soul on board can hear the call. ÔCause we're goin' back home come someday. And thirty-three would perish 'ere that fateful night was done. Hurricane by immigrant Italian artisans. one and it certainly could have been written about Maine. Hey, I'm from The County too. Every time I wander home again. How I fancy bumping into you. Are here in the Crown of Maine.